Pranav Mistry is one of those unique and inspiring individuals who have the capability of not only changing the technological world, but the computing world for greater society as well. He is one of the world’s true visionaries, who excels at the ability to fuse design with programming knowledge. Born in India, this computer scientist has obtained a number of degrees, including a B.A. in Computer Science and Engineering, an M.A in Media Arts and Sciences and a Master of Design from Industrial Design Centre. He was a Ph.D. candidate and a research assistant at MIT Media Lab. Mistry has also worked as a UX Researcher with Microsoft. At present, he is the Global Vice President of Research at Samsung and the head of Think Tank Team. 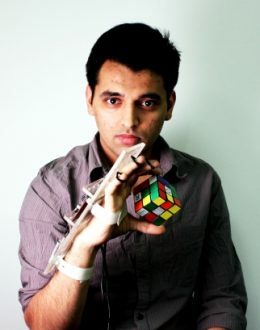 Even before his education has finished, Pranav Mistry had shown his capabilities as a designer and inventor with his creations including Mouseless – an invisible computer mouse, SPARSH – an innovative way to copy and paste between digital devices, Blinkbot – a gaze and blink controlled robot, a 3D pen, Quickies – intelligent sticky notes and his best known work on SixthSense. He has a lot of interests such as AI, Augmented reality, Ubiquitous computing Gestural interaction, machine vision, collective intelligence and robotics. Mistry is a self-proclaimed ‘Desigineer’. SixthSense is Pranav Mistry’s most inspiring inventions to date. The technology sees users wear a device that visually augments surfaces and objects we are physically interacting with. This produces a gestural interface that mimics the physical world around us with digital information. The system uses a camera and a tiny projector attempting to free information from its natural confinements by integrating it with reality and thus projecting the user’s entire world onto their computer. Mistry’s innovation was presented to a TED conference in 2009 and quickly became the talking point of many computer science experts. This technology is an undoubtable force in the forging of new systems of both artificial intelligence and real life.